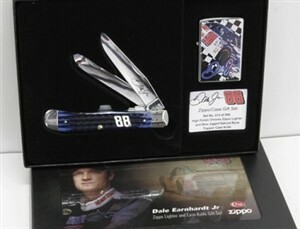 Part of a limited edition of only 500 knives, the commemorative Dale Earnhardt, Jr. gift set from W.R. Case includes a stylized Case Trapper knife and an enameled Zippo lighter from the company which now owns W.R. Case. This collectible gift set will look great on display, but the knife and lighter are so practical you'll probably keep them in your pockets. Case produced many Dale Earnhardt versions of its most popular knife styles with handle patterns representative of the famous driver's accomplishments. The knife in this set shows a unique design. Natural bone handle slabs embellished with a jigged pattern resembling tire treads create a functional and appropriate grip. The Trapper folds to 4-1/8 inches long with two high carbon stainless steel blades in the clip point and spey patterns. Dale's engraved signature decorates the base of the clip blade. Bolsters are the standard nickel silver, but Earnhardt's racing number "88" takes the place of the Case chevron. The black gift box frames a photo of Dale and his #88 car. The set also includes an enameled stainless steel Zippo lighter with a picture of the Earnhardt 88 against a checkered flag background. Each piece in the collection is numbered, and the knife is backed by Case's usual warranty -- good for the lifetime of the original owner. Zippo's windproof lighters carry a warranty that's equally strong -- send any defective windproof Zippo back to the company's repair center, and Zippo will restore it for free. For another commemorative collectible knife from W.R. Case, see the Case Johnny Cash Trapper.